A deed of land described it as commencing at the northeasterly corner of lot 17 on a certain plan, and bounded by certain streets named. These streets were private ways, and there were other private ways shown on the plan referred to. Held, that the grantee had a right of way over the streets named so far as to furnish him with communication with the public streets with which they connected, but not over all the private ways shown on the plan. If the owner of a number of lots delineated on a certain plan, on which are shown a number of private ways, conveys certain lots to A., and releases to him all his right, title, and interest over parts of certain streets, and then conveys to B. other lots not bounded on the parts of the ways so released, and refers to the plan, B. takes no title in those parts of the ways released to A. A deed of a lot of land described it as bounded on three streets, which were in fact private ways, "also the streets for public highways, as by a plan recorded in register's office for benefit of all concerned, drawn by" a person named. At this time, the land was pasture land, and the streets were not laid out or graded. Held, that the grantee had no right of way over ways, shown on the plan, which were remote from the granted premises, and a right of way over which was not necessary for the grantee's enjoyment of the premises granted. bounds of the previous conveyance was contained a lot which the grantor had previously conveyed, and that no plan had then been recorded; that, to prevent future disputes and misunderstandings, and to secure to the grantee his just right in the lots thereinafter described, it was agreed that the grantor should execute a new deed to the grantee. The deed then conveyed a number of lots by reference to a certain plan, and contained this clause: "It being understood that it shall not be competent for the said grantee, his heirs and assigns, to shut up or impede the passage through any of the streets designated on the plan." Held, that the grantor, having parted with his title to the land by the first conveyance, could not impose a servitude upon it by the subsequent deed. A deed conveyed a tract of land described as lot 1 on a certain plan. The land was bounded on two public ways. The plan showed these ways, and also a number of private ways, remote from the land conveyed, but connecting with the public ways. Held, that the deed did not, by reference to the plan, import a grant of any right of way over the private ways shown on the plan. Point, so called, in that part of Boston formerly Dorchester, to restrain the defendant from obstructing certain of the streets shown on said plan, over which the plaintiff claimed a right of way as appurtenant to his five lots. The defendant admitted the intended obstruction of Commercial Street and Union Street, to the eastward of Pleasant Street; of Washington Street, Plymouth Street, and South Street, to the eastward of Neponset Street; and of Pleasant Street, to the southward from Union Street; and contended that the plaintiff had no rights of way in this territory. The line of the intended obstruction began at the channel shown at the bottom of the plan, where the easterly line of Neponset Street touches it, and ran thence along the easterly line of Neponset Street to the southeast corner of said street and Union Street, thence along the southerly line of Union Street to the southeasterly corner of Union Street, and thence on the easterly line of Pleasant Street across Union Street and Commercial Street. defined streets; and at the northeast end there was a high bluff with steep descent, some thirty or forty feet above low-water mark, gradually sloping down to the wharf on South Street. The judge found for the defendant, and ordered the bill to be dismissed, with costs; and, at the request of the parties, reported the case for the consideration of the full court. Annexed to the report was an abstract of the deeds in the chain of title to the respective parties, beginning with a deed in 1804, from Edward Preston to Joseph Newell and Ebenezer Niles, of a tract of land consisting of twenty acres, fifteen rods, with beach and flats, then called Preston's Point, comprising all the point known as Commercial Point east of Barque Warwick Street. There were also annexed several plans, of which two only need be mentioned: The first, a plan made by Thomas Moseley, dated September 30, 1835, of which the plan printed ante, p. 38, is a sketch. This sketch shows the relative situation of the streets, but not all of the subdivisions of the lots shown on the plan; nor does the sketch show the whole of lot 5, which is represented on the plan as a large lot, and bounded on the northwest and west by Mill Street, a public highway. The second, a plan recorded in the registry of deeds on July 18, 1810, and which purported to be taken from the original by Mather Withington on July 12, 1810. The earliest reference, in the deeds relating to the property, to a plan of Withington, is in a deed from Newell and Niles dated December 1, 1806. The plaintiff's lot 5 does not appear at all on the Withington plan. The same streets appear on both the plans, except that South Street bears no name on the Withington plan. Commercial Street is also represented on this plan as terminating at its easterly end at this unnamed street, instead of at Plymouth Street, as on the Moseley plan. The language of the deeds under which the parties respectively claimed sufficiently appears in the opinion. E. Avery & E. M. Johnson, for the plaintiff. C. P. Greenough, for the defendant. MORTON, C. J. The plaintiff contends that he has a right of way over the streets shown on the plan, as appurtenant to the lots of land owned by him. premises, which include the first three lots, to Clement Willis, describing the land as "commencing at northwesterly corner of lot 17 on plan of Moseley," and bounded by land of Berry and Wheeler, and by Commercial Street and Union Street. Willis, having foreclosed his mortgage, conveyed the first three lots to the plaintiff by deed dated December 21, 1881, containing substantially the same reference to the plan. The fourth lot comes to the plaintiff by mesne conveyances from the assignees in bankruptcy of John Preston. We are not furnished with full copies of these deeds, but we understand that they contain only the same general reference to the plan. These deeds undoubtedly give the plaintiff a right of way over the streets named in them, Commercial Street and Union Street, so far as to furnish him with a communication with the public streets with which they connect. This right is not questioned. But they refer to the plan merely for the purpose of description and identification of the lots conveyed, and do not, either expressly or by implication, annex to those lots a right of way over all the streets laid down on the plan. Indeed, Preston could not convey such a right over most of the streets. 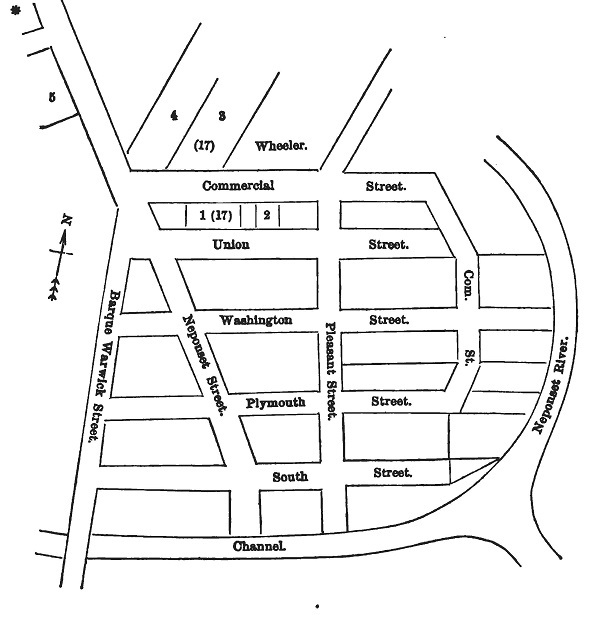 In 1872, Preston, being the owner of the four lots of the plaintiff, and various other lots delineated on the Moseley plan, conveyed to the defendant certain lots east of Pleasant Street and south of Washington Street, and bounding on Washington Street, Plymouth Street, Commercial Street, and Pleasant Street, and on the Neponset River. By this deed, he released and quitclaimed all his right, title, and interest in and to said streets, and in and to the soil of the same, wherever they are adjoining to, or bounded upon, said lots; and he also released "all right of way over and through said Commercial Street, as laid down on said plan, from a point one hundred feet westerly of its junction with Pleasant Street to its union with Plymouth Street, so called, all right of way over and through Union Street, so called, from a point two hundred feet westerly from its junction with Pleasant Street to its union with Commercial Street, all right of way over and through Washington Street from the easterly side of Neponset Street to the Neponset River, and all right of way over and through said Pleasant Street, from northerly side of Plymouth Street to low-water mark in a northerly direction." This is an answer to the plaintiff's claim of right of way over all the streets covered by this release. If any rights of way existed as appurtenant to the four lots now owned by the plaintiff, Preston, being the owner of the dominant estate, had the right to release the servient estate from them and to extinguish the servitude. Parker v. Moore, 118 Mass. 552 . This he did by his deed to the defendant, and thereafterwards neither he nor his grantee could renew or grant to any one the right of way thus extinguished. But this deed also shows that, when Preston and his assignees conveyed to the predecessors in title of the plaintiff, they could not have intended, by a reference to the plan, to convey by implication rights of way over the streets as laid down thereon. Even if Preston had, as appurtenant to the four lots now owned by the plaintiff, a right of way over the streets which are in dispute, we are inclined to the opinion that a right of way over the streets not included in the release, under the circumstances, would not have passed to the plaintiff, as the situation of the estate and of the parties seems to show that the reference to the plan in the deeds by Preston and his assignees was merely for the purpose of description and boundary, and not with the intent to convey, by implication, remote rights of way, not necessary to the enjoyment of the premises conveyed. But we are of opinion that the plaintiff's claim that Preston had a right of way over the streets in dispute, as appurtenant to the four lots now held by him, cannot be sustained. benefit of all concerned, drawn by Mather Withington." This deed cannot be construed as an express grant of rights of way over all the streets shown on the plan, the words "the streets for public highways" clearly referring to the streets before named in the deed. Can it fairly be construed as a grant by implication of such rights? What is the purpose and effect of a reference to a plan in a deed, is a question of the intention of the parties. In the absence of an express grant, a grant by implication of an onerous servitude upon other land of the grantor, not necessary for the enjoyment of the land conveyed, is not to be presumed unless such is clearly the intention of the parties. When the deed to Foster was made, the land delineated on the Withington plan (which is similar to, but not identical with, the Moseley plan) was pasture or waste land. The ways had not been laid out or graded on the land, but they existed merely on paper. They were not monuments on the land by which to bound and describe the premises conveyed, and a reference to the plan was convenient, if not necessary, for this purpose. The lot sold to Foster bounded upon a public highway. There was no need, therefore, of any right of way to furnish an outlet to the public streets. We think the plan was referred to for the purpose of description, and that the deed does not import a grant of a right of way over any of the streets in controversy in this case; they are remote from the premises granted, and a right of way over them is not necessary for the enjoyment of such premises. error in a former deed. The grantors had no title to the land described in it, having previously parted with their title, and no right to create any servitudes upon the land. Whatever may be its effect between the parties, we see no principle upon which it can operate as a grant of any easements, legal or equitable, to any of the plaintiff's predecessors in title. For the reasons stated, we are of opinion that the plaintiff has not now any right of way over any of the land in controversy, as appurtenant to his first four lots. The question remains, whether he has such right as appurtenant to his fifth parcel. His title to this lot is derived from the Commercial Point Association, which, in 1841, conveyed it with other lots to Elisha Preston. This deed conveys a large lot of upland and salt marsh, being lot "numbered one upon a plan of land belonging to the Commercial Point Association, which plan is dated September thirtieth, eighteen hundred and thirtyfive, and drawn by Thomas M. Moseley, Surveyor." The land is situated on two public streets. For the reasons stated above, we are of opinion that the reference to the plan was for the purpose of description and boundary, and that the deed does not import a grant of any right of way over the land in controversy. Coolidge v. Dexter, 129 Mass. 167 . Williams v. Boston Water Power Co. 134 Mass. 406 . The plaintiff derives his title to the fifth lot from Elisha Preston, and has no greater right than he had. The result is, that the plaintiff cannot maintain his bill. Whether the defendant has the right, as against other parties, to close up these streets, is a question not before us. It has violated no right of the plaintiff, and he cannot complain. [Note p43] This deed, which was a deed poll, after reciting the conveyance by the grantors to the grantees of a lot of twelve acres, "agreeably to a plan of Commercial Point recorded at the register of deeds' office for the county of Norfolk," that within the bounds was contained a lot previously granted by them to a third party, and that no plan was at that time recorded, stated the object of the deed to be "to prevent future disputes and misunderstandings, and to secure and to confirm unto the said" grantees, "their heirs and assigns, their just and lawful rights in the lots of land and flats or water lots hereinafter described, it is agreed between the parties that the said Newell and Niles shall make and execute and deliver to the said Callender, Jenkins, and Callender a new deed of such lots of land, flats, or water lots aforesaid." Then followed a conveyance of a number of lots, and among them the lots now owned by the plaintiff and numbered 1 and 3, by reference to a plan recorded in the Norfolk registry of deeds, immediately following which, and before the habendum, was this clause: "It being understood that it shall not be competent for the said Callender, Jenkins, and Callender, their heirs or assigns, to shut up or impede the passage through any of the streets designated on the plan of said Point, recorded as aforesaid."